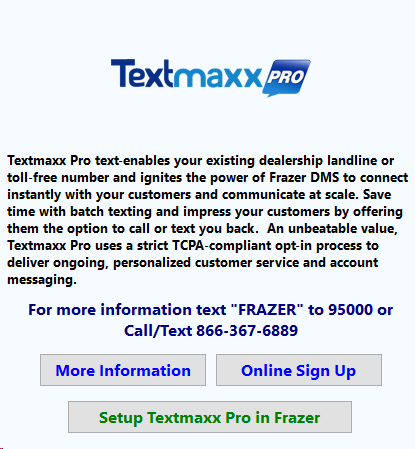 Textmaxx Pro enables your dealership to text your accounts from your existing business phone number. You can create batch texts to automate payment reminders and offer your customers the option to call or text you back. Texmaxx Pro follows TCPA-compliant procedure to opt in your customers letting you customize your account messaging and customer service. Note: This must be completed before you can set up individual customers or opt in groups of customers. First, access Textmaxx Pro by going up to Customers → A-Text Messaging. This will take you to a landing page about TextMaxx Pro. 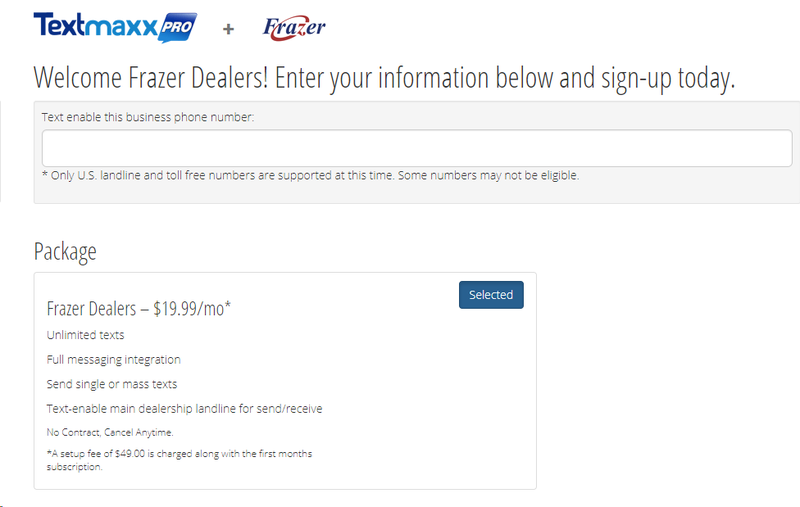 If you haven’t done so already then you should click the “Online Sign Up” button and follow that link to the Frazer dealer sign up page. Enter the contact information for the dealership and then click “Confirm Order” at the bottom of the screen. Textmaxx Pro will be reaching out to verify that your business is the owner of the phone # before they will enable it for texting. After they have reviewed your information they will send you an email with an API key. You will have to enter your key (see below) into Frazer to link it to TextMaxx Pro. With the API key, go to Customers > A - Text Messaging. Select and copy and paste the API key from the email you received into the field below. Once you’ve entered the code, click Setup and you will be presented with a list of eligible customers. Those customers are ones that are BHPH customers that are not written off or paid out, as well as Outside Financing and Cash customers with pick-up notes and repair balances. These customers must also have a Cell phone or a Home Phone to be signed up. 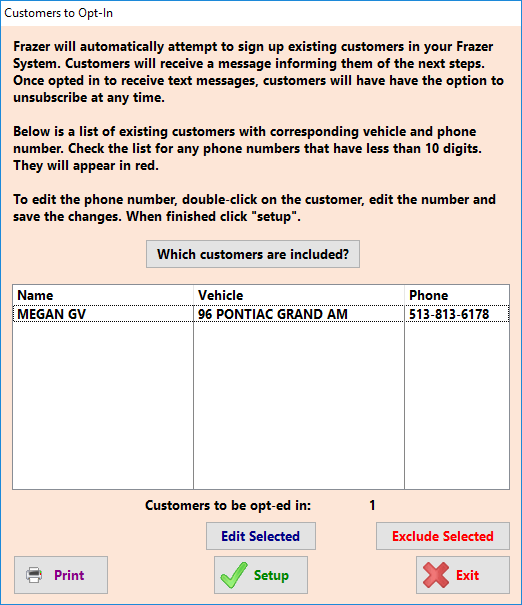 From here you can print a list of eligible customers, setup eligible customers, or exit the process. If a customer appears in red then the phone # has been formatted incorrectly and should be edited. Double clicking on any customer will let you change their opt in information. You won’t be able to finish the opt in if there are red customers that haven’t been excluded. To exclude a customer, highlight them and click the exclude selected button. NOTE: Clicking setup will send real texts to your customers. If something doesn’t seem to be working right, then reach out for support before trying again. If you continue to click setup, your customer could be potentially spammed with opt-in messages. Frazer will let you know when the opt-in process is complete. Once you click OK here, a report that lists all of your successfully signed up customers will appear. You’ve now completed the setup process. To send individual texts or batch text please follow the steps found later in this article. To send an individual message, choose the customer you want to text. Enter Customer Activity and then click the “Text Messaging” button. This is going to open directly to the Send Template messages tab. 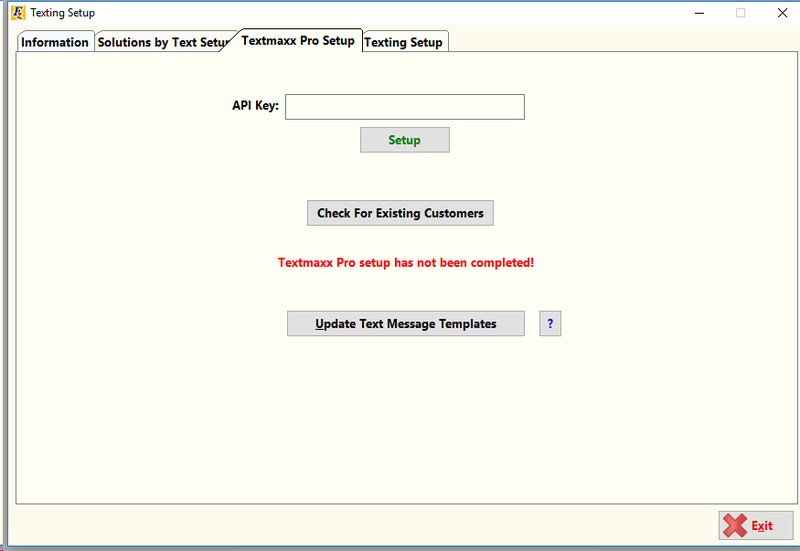 This tab is going to include preset messages that TextMaxx pro included in your install. More can be added by contacting TextMaxx pro, and updating the text message templates. To send text messages to more than one person at a time, you will have to set up a batch message. You can save these for future use. To set them up you should go to Customers drop-down → Text Messaging. Then you should select “Create a new batch text”. You will then see the template to select for the batch, then press “Select Customers to Receive This Message”. This screen lets you set up groups of customers by due date, sale date among other factors. The message on the right is going to describe the range of customers that this will contain. After getting setup with texting you should see a cell phone icon at the top of the screen. This will be green if there are any incoming text that have not been viewed yet. Editing templates can be done from the Textmaxx Portal. To get to that page go to https://textmaxx.com . You’ll be able to log in with credentials you receive from Textmaxx Pro. Once you login you will see the message templates you have from them and have the ability to edit those messages.